Yesterday morning, I planned to get up super early to see Brad off and run an easy three miles before my graduate school alumni breakfast. There is a Gold’s Gym adjacent to my hotel and passes are $7 a piece. It’s kind of pricey, but I’m not familiar enough with Research Triangle Park to run through it, especially not in the dark at 5 am. It was pretty cold yesterday morning, so being the baby I am, I decided to run as fast as I could from the door to the hotel to the door to the gym, which was only about 100 yards. Rather than run on the sidewalk, I sprinted through the grass trying to get inside to escape the cold. The next thing I knew, I was laying face down on the sidewalk, completely unaware of what had just happened. My knees were throbbing as I rolled over on my back and tried to pull my thoughts together. I stood up slowly and saw the curb, partially hidden from view by grass, from the direction I had been running. Then I realized, my foot had caught the curb and I ate pavement. Complete wipe out. I hobbled into the gym and told them what happened. The ladies behind the counter was so nice, and fixed me right up with bandages and ointment. I said to them, “Maybe I’ll just come back later”. Then, I remembered that just a few weeks ago, I ran a marathon with a stomach ache. I knew I could run three miles with some banged up knees. I took it easy and lowered the incline to 0% once I started to feel an ache in my back. By the end, I was able to significantly increase my speed and increase the incline to my typical 1%. I finished in just over 29 minutes. I felt good for doing my run despite my accident. 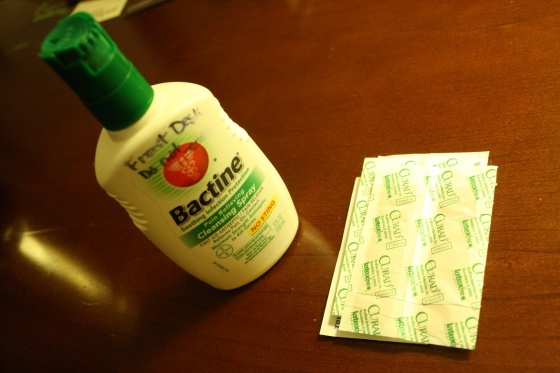 The concierge at the hotel was able to give me more bandages and loaned me their Bactine, which took the sting out of my skinless knees. My right knee is way worse off than my left knee, but it will heel in time. I also scraped my right thigh pretty badly. It’s hard to tell in this photo, but there is a definite line where my shorts stopped. The skin below it is very scraped, while the skin under my shorts are unscathed. Today, my knee looks much better but I have to keep it bandaged or it oozes through my pants. Nice, right? I’ve completely removed the bandages from my left knee which doesn’t look so bad. My scraped thigh actually looks woret. It looks like a brush with teeny tiny claws was drug down my leg, causing it to be red and swollen. Lovely. It’s really not so bad. I’m a little wary of running this weekend in tights or pants in the cold. The most painful part has been taking my pants off, as well as standing up and sitting down. Each time, my pants material scrapes my knee. Ouch. In more pleasant news, I’m heading home from my conference today. Don’t forget to enter my coconut peanut butter giveaway. You have until tomorrow morning (9 am, Saturday) to enter! ahh!! that is horrible!! i hope it heals quick! too! Such a sweet face. And I know the honey is a big pull too. Hope your knees are back ready to run quickly for you! oh OUCH !! sorry – but at least it’s just scrapes and not a turned ankle, right? hope it’s all healed soon. 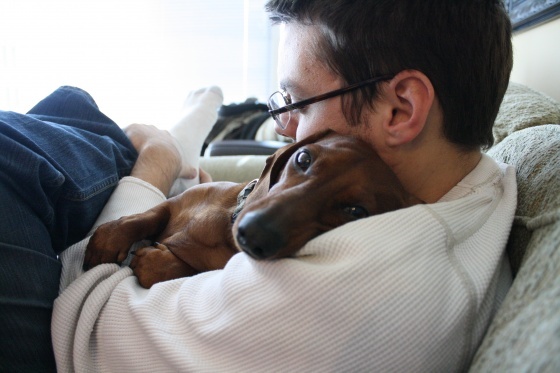 and LOVE the last photo, of course… what a sweetie pup! Oh no! How frustrating. But I’m glad you weren’t more seriously hurt. I fell badly during a run a year and a half ago and I still have scars on my knees and thumbs. Who knew running was a contact sport? Aw!!! I’m so sorry that your knees got all scraped up! If it makes you feel any better… I’ve fallen like that before in the middle of summer. No ice in sight. Just a blip in the sidewalk. Oops? Scraped up the palms of my hand pretty bad!! ouch! hurt just to read this. heal quickly.